REVOLUTION WALL MIRROR home decor, jewelry, decor, decorations, electronics, fountains, floor mats, art glass, vases, garden essentials, fireplace screens. 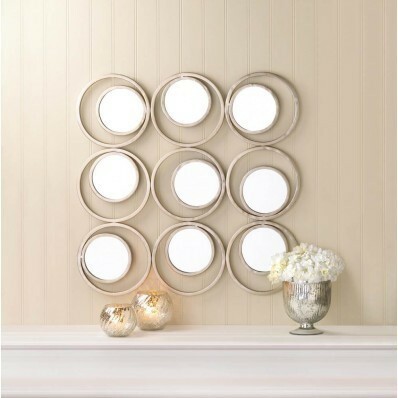 Beautiful circles and round mirrors collide to create this dramatically modern wall decor. The iron framework holds nine circular mirrors that will reflect light around your living space in style. Material(s): IRON MIRROR. Weight 10.4 pounds. Dimensions 29.8" x 0.5" x 29.8".